UPDATE - This post is now expired. NUS is no longer accepting ECareers as a valid place of study. If you know of a similar method, please comment below. You can get an NUS student card even if you're not a student. Save money on all your favourite brands including Amazon, Apple, Zavvi, Spotify and more. Don't forget to get a course first, before applying for your NUS card. Choose what how many years you want the NUS discount card for. I chose 3 years which costs £32. Upload a headshot photo of yourself. This will be printed on the back of the NUS student card. 'The ECareers Student Number'... this is a strange one. Please read carefully: ECareers may not give you a student number. You need to type something else instead. Latest Dealers have had success typing their ECareers email address, date of birth, or "N/A". You can try any of these but we'd recommend date of birth. Confirm the order and pay. You will receive two email verifications. One to say it is being reviewed, another to say it is on its way. 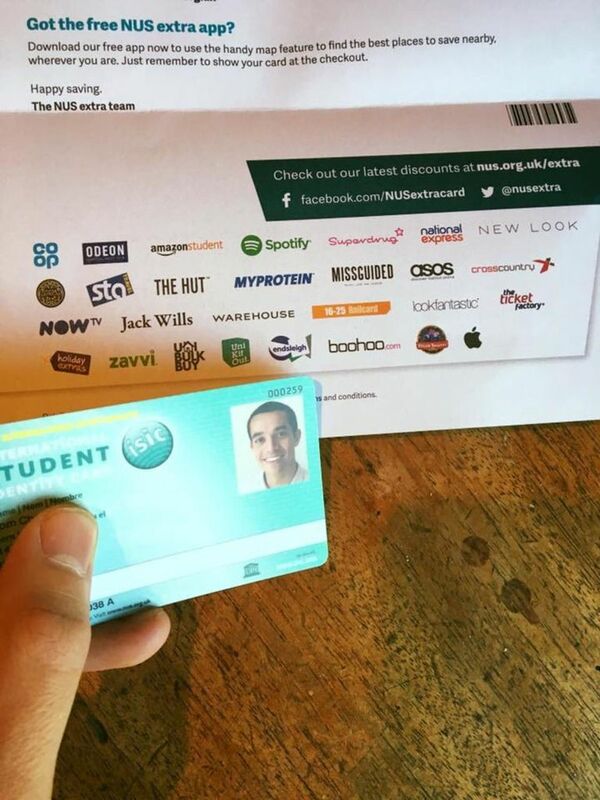 Enjoy the NUS card and start saving money. You can get discounts at many of the biggest brands across the UK. Plus, on the reverse side of the card is an International Student Identity Card that gives you discounts around the world. This is a great way to save money when not a student. With the NUS card you can save on National Express, Odeon, Jack Wills, ASOS, NOW TV, Pizza Express, Domino's Pizza and more. Usually the discounts from the NUS card are about 20%, but can be up to 50% off such as at Ed's Easy Diner. ASK Italian does 40% off and Microsoft offers 50% off select products. If you haven't got an NUS card yet, or are an adult but want one even though you're not a student, sign up today. I recommend buying the card for 3 years, which is currently £32 (free delivery), making it the cheapest per year. Do you shop at The Co-Operative? One of the biggest benefits of getting an NUS discount card even when you're not a student is if you shop at The Co-Operative. The supermarket gives you 10% off with the NUS Extra. What discounts comes with the International Student Identity Card? You can get a student card even if you're not an adult, and the NUS Extra includes an ISIC on the back. It's actually what I've photographed at the top of this blog post. ECareers is an online educational site where you can buy courses to learn a range of subjects. You can get your first course for free. Some do not require you to finish the course. It is within the NUS Extra terms & conditions that you must have a valid and active ECareers course when you buy your student card. Who are you? What is Latest Deals? My name is Tom and I'm an extreme deal hunter. Every day I find the best money saving offers, discounts and freebies and share them. I am a member of Latest Deals, a community of bargain hunters. We love price glitches, hot UK deals and incredible competitions. If you like saving money, join us today. It's free. Thanks for posting it. I'll definitely be considering it. I received this feedback from someone - thank you! "There was a little flaw on your guide, it asks on the last page when you’re adding card details for a "student code”. From what I remember looking at this years ago it’s a code that the university or college give the students who apply online for the card. It seems they have stopped checking it, but I had to write something random like “Student123” into the field to complete checkout." Update - you can now use your NUS card at Co-Op giving you a 10% saving every time! Thank you for this. I've just completed mine, £32 for 3 years like you said it would be, plus £1.50 delivery. Good share! katiefoster51 that's great! Such a good way to grab bargains. Let me know if you find any good places to use it! Mine has been 'processed' so I'm hopeful I'll receive it in the post soon, cheers Tom. I Will Get My Card Now "Mature Student"
Nice! It's such a great way of saving money. Just ordered my card -and look lik an interesting course to boot. Thanks! It worked for me! I'm excited to get my NUS card. Thanks Tom! CherylMc Unidays is a different site... NUS is not the same as Unidays. You have to be enrolled to college etc to have a Unidays account. The NUS website is asking for my shaw academy student number. Where can I find that? I don't agree with this. Student perks are meant to be just for students, not for people to take advantage of like this! I kind of agree with you gellerbing. You would think that the Shaw Academy and the NUS would be all over this. But if it works, and judging by the above comments, people will naturally take advantage. Maybe you do have a point, but there are ill people who can't work, people genuinely in more need than students, where's their 'discount'? It doesn't seem to come up with anything when I type "Shaw Academy" or "The Shaw Academy". Does this course/study place still work? would this way get us uni days discount do we get a proper student address? No, UNiDAYS requires a university email address to register from what I understand. I am doing a 'distance learning' course it's on the place of dropdown list. Didnt have to pay anything to join the course either. Let me fill in whole form no probs. I can't find this course CherylNdale? can you point me in the write direction please?